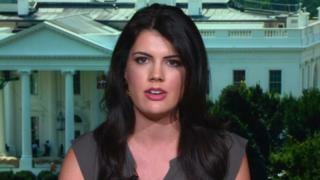 Image caption Payton appeared on the BBC to debate President Trump calling the press "the enemies of the people"
Online magazine The Federalist, which Payton wrote for, said she "brightened the lives of everyone around her". Payton made several appearances for Fox News, and also appeared on other major channels, including the BBC and CNN. "She fought strong and lived a life worth noting in the books," a memorial page said. "We are so incredibly honoured to have known this wonderful human being." Meghan McCain, the daughter of the late US Senator John McCain and a prominent political commentator, paid tribute. H1N1 is an influenza virus subtype. A new strain of it that was declared a pandemic by the World Health Organization in 2009 became popularly known as swine flu. Children and young adults have been particularly affected.